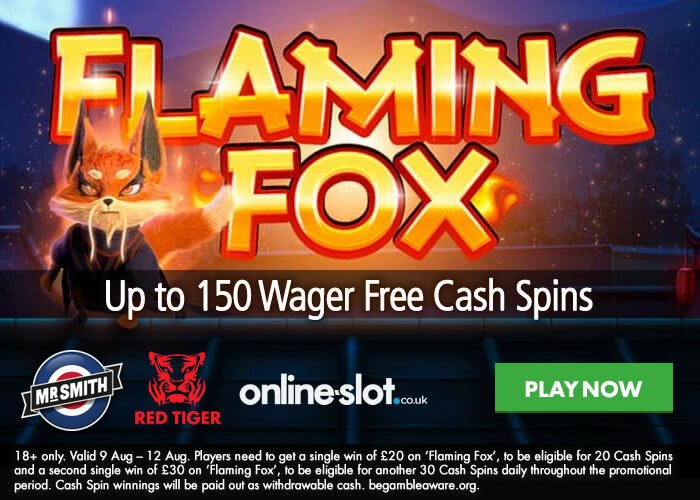 Red Tiger Gaming has just released the Flaming Fox slot – find out where to get up to 150 wager free cash spins – all winnings are yours to keep. Flaming Fox has just been launched and Mr Smith Casino are celebrating by giving away wager free cash spins – to get them, get a single win or £20 or more on Flaming Fox to get 20 cash spins. Then get a second single win of £30 or more to get 30 more cash spins. You can do this daily until Sunday the 12th of August (2018) – that means 50 cash spins per day for 3 days which equates to 150 cash spins altogether. Cash spins are free spins with no wagering requirements whatsoever – what you win is yours to cash out/keep! Flaming Fox is powered by Red Tiger Gaming and has 5 reels and 10 paylines. With win both ways technology, you can spin away from as little as 20p a spin on desktop, mobile and tablet devices including iOS and Android. With a martial arts theme and cartoon style graphics, it looks superb. Look out for the Flaming Fox randomly appearing in the base game – he torches the reels to deliver higher value symbols or synced wilds. He can strike again to make wilds sticky for the next spin for huge wins. Flaming Fox is all about the Free Spins feature where you’re awarded a random number of free spins. Look out for scatters appearing during the feature as an extra free spin will be added to your tally. The Flaming Fox can also randomly appear to set symbols on fire – this will then sync symbols, reels and even wilds! Once he does any of this, it remains in place for the duration of the feature. High variance, you can win up to 3,333 times your stake on every spin/free spin – read the Flaming Fox slot review for full details. Not played at Mr Smith Casino? Dedicated to UK players, they boast over 1,000 slots from all the big software providers like NetEnt, WMS, IGT, Yggdrasil Gaming, NextGen Gaming, Play ‘N Go, Microgaming and Novomatic amongst others. If you want new releases, they always have them with Pragmatic Play’s Leprechaun Song, Microgaming’s Exotic Cats, NetEnt’s Swipe & Roll and Novomatic’s Legends of the Seas just a few of the recently added. Sign up now and get up to 200 cash spins on NetEnt’s Starburst. 18+ only. Valid 9 Aug – 12 Aug. Players need to get a single win of £20 on ‘Flaming Fox’, to be eligible for 20 Cash Spins and a second single win of £30 on ‘Flaming Fox’, to be eligible for another 30 Cash Spins daily throughout the promotional period. Cash Spin winnings will be paid out as withdrawable cash. begambleaware.org.